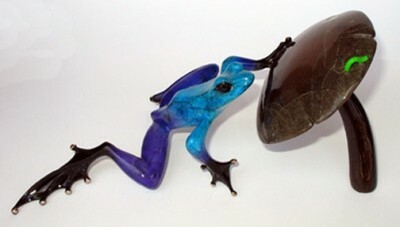 Dingley Dell, rare edition purple Frogman Bronze sculpture. A rare, purple/blue variation of Dingley Dell in an edition size of just 50. This unique, rare edition bronze has stunning, luminous purple/blue patina. Available in the UK from Westover Gallery for the very first time. Amethyst – 2014 Show Frog!